The term "white paper" comes to us from a 100-year-old practice of government reportingin the UK. When government agencies provided data to Parliament to help them make decisions, they would offer three different types: Very long, comprehensive documents with a blue cover, open-ended reports with a green cover, and short, focused reports on a single topic with white covers. This last type, the concise document with information to solve a problem, came to be the formula for what is now known in many industries as a "white paper." Today, white papers are produced for sales purposes by for-profit companies, making them a marketing tool that can often be confused with a neutral scientific paper. While both publications have their purpose, it is important for the consumer to know how they differ. Today we will compare these two documents in order to help our readers see beyond the surface similarities and become aware of the important differences. On the surface, commercial white papers and scientific papers published in journals appear similar. They are both presented with an emphasis on narrative rather than design, so neither will have flashy artwork or photographs and statistics are presented in black and white tables or graphs. They are similar in length - from 6 to 12 pages, give or take. Both will have citations, either as footnotes or end notes, using current research from respected journals and thought leaders. Even the formatting will look similar, with section headings including a brief summary, background, analysis, and presentation of data. Looking behind the surface, however, reveal 3 important differences. Commercial white papers are written by a company's in-house staff or by a freelance writer under contract. The writer meets with the marketing staff to discuss the information to be presented, to determine an angle, and set parameters on facts and messaging. The author may have a background in the topic or product, but this is not required. The entire process can take anywhere from 25 - 50 hours to complete, from planning to publication. Final editing and approval is granted by the sponsoring company. Ultimately, the white paper reflects directly on the company that sponsors it, not directly to the author. This anonymity could not be further from the authorship of scientific journal articles. For these documents, the authors are not only responsible for the narrative, they are also the lead investigators in the study, the experts analyzing data for their peers in the scientific world. Their published work is inexorably tied to their names, their careers, and their professional legacy. Important publications will continue to be cited in future work, each citation listing their name and article. Journal authors also take complete responsibility for the content of their articles, presenting their data at conferences, answering questions for interviews, and providing additional materials to those researchers wanting to know more. Final approval for these publications is granted by a panel of peer editors as well as the journal editor, often after several rounds of edits and clarifications that can take up to a year - in addition to the months or years required for the study itself. The goal of the white paper is to direct the reader towards making a specific decision. 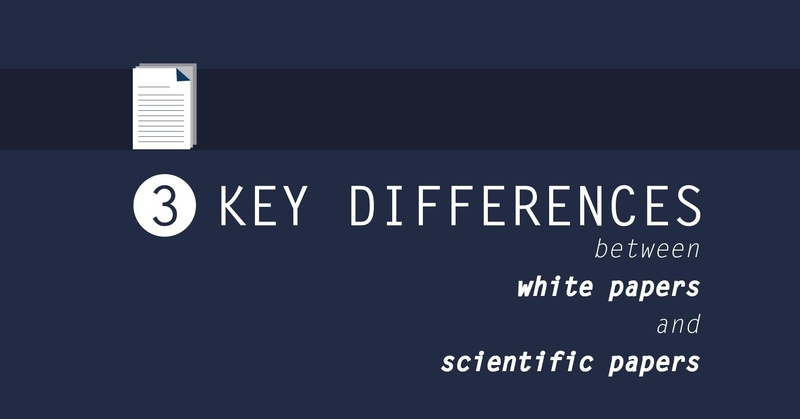 In one definition of a white paper, this type of document is "a persuasive essay that uses facts and logic to promote a certain product, service, or viewpoint." The author directs the reader to a specific conclusion using carefully-selected facts and logic, all with the desired result of portraying the product, service, or viewpoint in the best possible light. In contrast, an academic paper will present the results of a study in order to contribute to the body of scientific knowledge, "warts and all." That is to say, the author's goal is to put forward data with analysis that add to the scientific conversation, to help clarify a bigger picture, and hopefully encourage further research. The author will build a logical framework with evidence from previous work, while acknowledging opposing viewpoints or possible contradictions. Every scientific paper will contain clear mention of the study's strengths and weaknesses, and any concluding statements will be carefully phrased in order to remain open-ended and neutral. If the goal of the white paper produced by a for-profit company is persuading the reader to reach a specific conclusion, then the desired result of that document is a sale by the company that sponsored it. A white paper may not contain a sales pitch, but its carefully crafted message is intended to guide the reader to a specific decision: Investment in the product being described. For a scientific journal article, the goal is to add to the body of knowledge in a meaningful way. Evidence of the relevance of this contribution can be the citation of that work in future presentation and/or articles published in the same field. Authors of significant work may also benefit from career advancement, requests for presentations at conferences and symposia, and availability of granting opportunities to continue their research. These results may seem amorphous to the layperson, but contributing to the vast body of academic knowledge is the pursuit of every research scientist. Just as the teacher aims to awaken a love of learning in a student, or a doctor works to heal a patient, the research scientist hopes to add a brick to the growing foundation of scientific knowledge, knowing that the brick may be the keystone to even greater discoveries. This is not to say that all scientific papers add meaningfully to the body of knowledge, nor that all white papers are devoid of scientific value. Not all scientific papers are devoid of corporate influence, with some companies investing in research that then is published in an academic journal (with full disclosures in the publication). And not all white papers are a part of a corporate sales funnel. There are white papers produced by non-profit organizations, including professional associations, that are also persuasive rather than neutral. (An example would be a white paper about climate change produced by an environmental non-profit agency.) In these cases, the goal is to present and defend a specific viewpoint with no direct sales or commercial interest in mind. Some of these types of white papers will be published by trade magazines, appear in conference proceedings, and even be cited in other literature. While they are not neutral per se, they are not commercial in intent. Commercial white papers can be helpful. For a potential customer considering a product, it can present a lot of information and statistics in a streamlined form, help the reader convince others about their support of a product, and identify practical ways to decide whether or not the product is a good match for one's needs. It's important for readers to always keep in the back of their minds, however, that it is a marketing tool that may not present a complete picture. In an academic hierarchy, the scientific paper will be considered superior, since they are unbiased and peer-reviewed. Ideally, a consumer will use both white papers and scientific research to make the best decision for their needs.